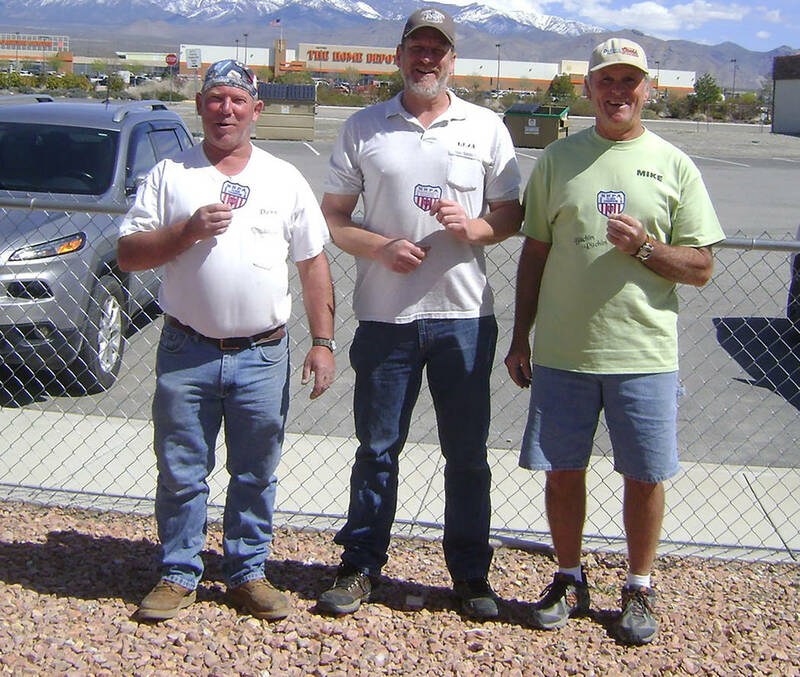 Mike Norton/Special to Pahrump Valley Times Class B champion Dave Barefield, tournament champion Neal Schulte and Class C champion Mike Nicosia after the Pahrump Spring Open horseshoes tournament on March 23 at Petrack Park. 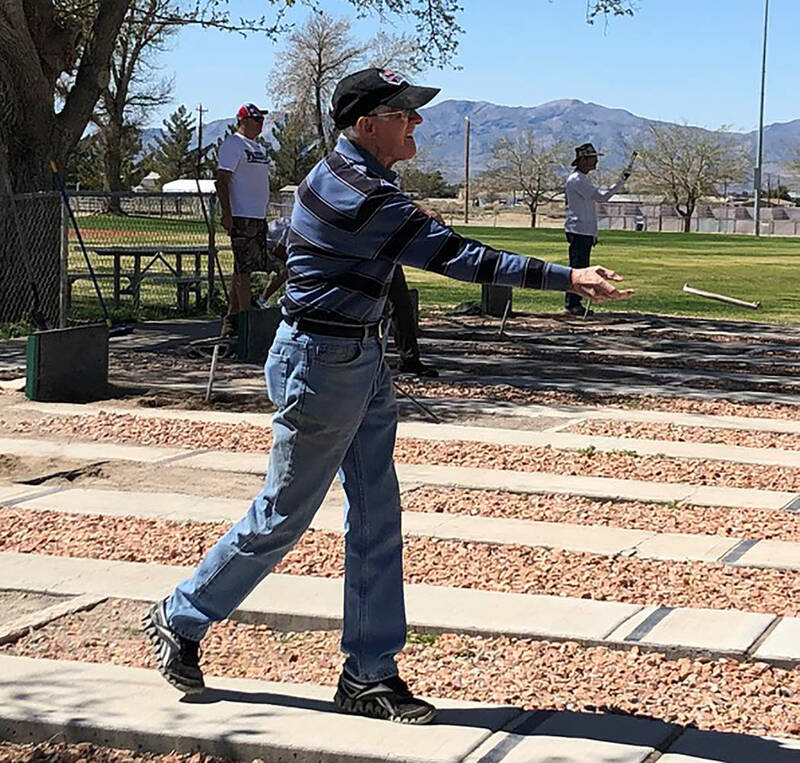 Tom Rysinski/Pahrump Valley Times Fred Kennedy, 90, of Las Vegas won two games, tied two games and lost once at the Pahrump Spring Open, his first sanctioned horseshoes tournament. 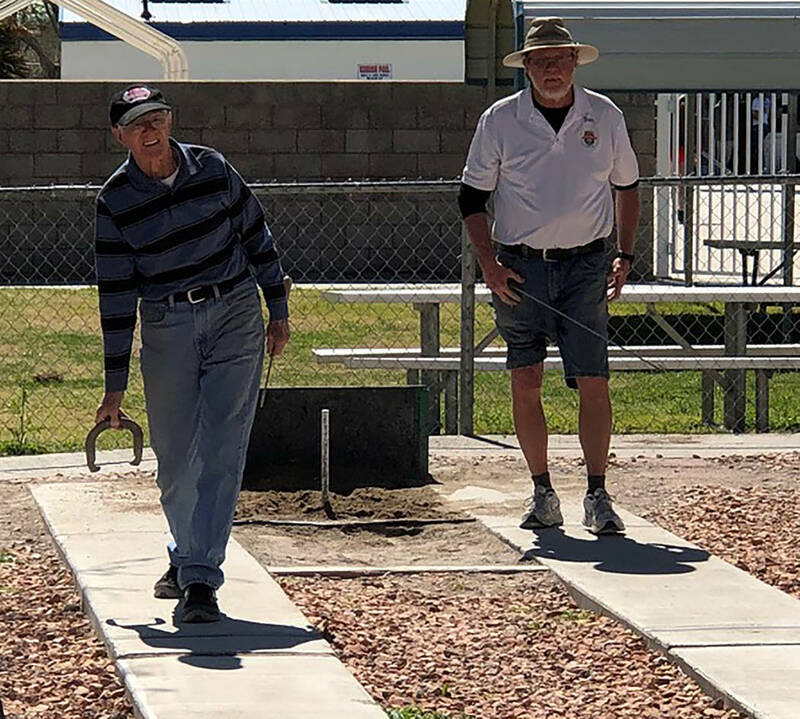 Tom Rysinski/Pahrump Valley Times Fred Kennedy, left, pitches as Don Brown waits his turn during a B Division game at the Pahrump Spring Open horseshoes tournament Saturday, March 23 at Petrack Park. And while he might not have won the Pahrump Spring Open, 90-year-old Fred Kennedy of Las Vegas was pleased with his performance. Not only did he finish third in the middle group at his first tournament, he only picked up the game seriously four months ago. Even if it means making the drive over to Pahrump for his first NHPA tournament. The tournament champion was another Las Vegan, Neal Schulte, who went undefeated in Class A. The late Don Weaver was a 2007 inductee into the National Horseshoe Pitchers Association Hall of Fame. Schulte’s ringer percentage going into the Pahrump Spring Open was 30.18, and he pitched to a 31.25 on Saturday. Schulte, a Nebraska native, said he makes two or three of the tournaments held in Pahrump each year. On Saturday, he was one of 16 competitors. Mark Kaczmarek and Dave Barefield finished tied for first in the Class B, with Barefield winning in a playoff. Mike Nicosia went 4-0 to capture Class C.
Norton said the prize money was $35 for first, $20 for second and $15 for third in each of the three divisions. The next tournament on the schedule is the Don Weaver Memorial on April 6 in Las Vegas, with the next tournament in Pahrump the Best of the West on May 4 at Petrack Park.